Seattle City Light's community solar projects help bring new, clean and renewable energy to our area. It benefits you and the host site while promoting conservation, sustainability and community. Seattle City Light has teamed up with affordable housing provider Capitol Hill Housing (CHH). Capitol Hill Housing helps people of limited means to have a home by providing secure, affordable apartments to more than 1,700 of our neighbors across the city. The system is on the roof of a 30-unit apartment building located in the heart of Capitol Hill. 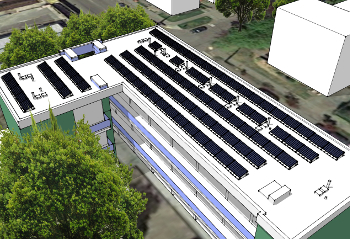 Although owned and managed by City Light between now and June of 2020, this is also a key project of the Capitol Hill EcoDistrict - a neighborhood-based sustainability initiative serving the most densely populated urban village in the Pacific Northwest. When the project ends mid-2020, full ownership and management of the system will be transferred to CHH and the energy generated will help reduce their operating costs, which directly translates into benefits for CHH tenants. Live solar data can be seen here.